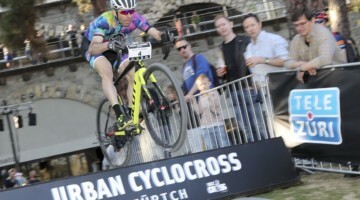 When the clock strikes midnight and the calendar year turns over, some racers are excited for a fresh start, with new bikes and kits to unveil and a new sponsor to impress. At the annual January 1 GP Sven Nys, racers in such a position and mindset are given their first opportunity to turn a new pedal. 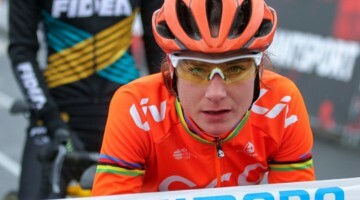 Seven-time World Champion Marianne Vos certainly would be happy if the rest of this cyclocross season mimics the final month of seven earlier ones, but with a new WM3 Energie Pro Cycling team, Ridley cyclocross bike and a late comeback to the sport, the Dutch racer can’t be faulted for seeing 2017 as a new beginning after a few injury-plagued years. At the 2017 GP Sven Nys, Telenet Fidea Lions kept their sponsors but were eager to impress. The race is named after the legend who happens to be their team director. Ellen van Loy skipped the New Year’s champagne and was champing at the bit to show her fellow racers that her fitness issues from just a week ago were behind her, and once again took command of the holeshot. While recent rains gave the mudders hopes of a sloppy, heavy race, the cold morning offered hard, frozen ground with little mud. 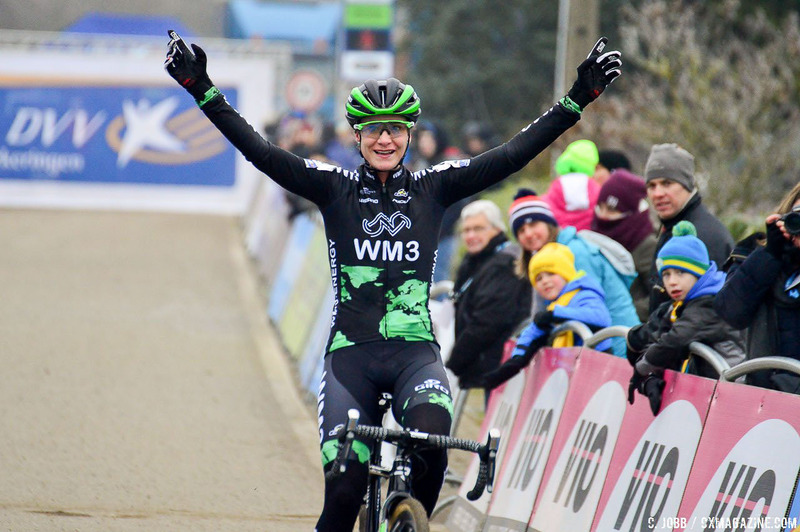 Van Loy attacked the frozen course, quickly putting Vos, Sanne Cant ( Enertherm BKCP), Laura Verdonschot ( Marlux – Napoleon Games) and World Champ Thalita de Jong (Lares Waowdeals) on the defensive. 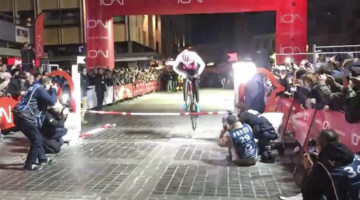 It was a familiar sight, and fans could be forgiven to expect Van Loy to fall back and relinquish the lead to the Azencross’ podium trio of Cant, Vos and De Jong. However Van Loy had other plans, and continued pushing at the front solo, until Vos escaped Cant and De Jong and Verdonschot and joined her on the second lap. 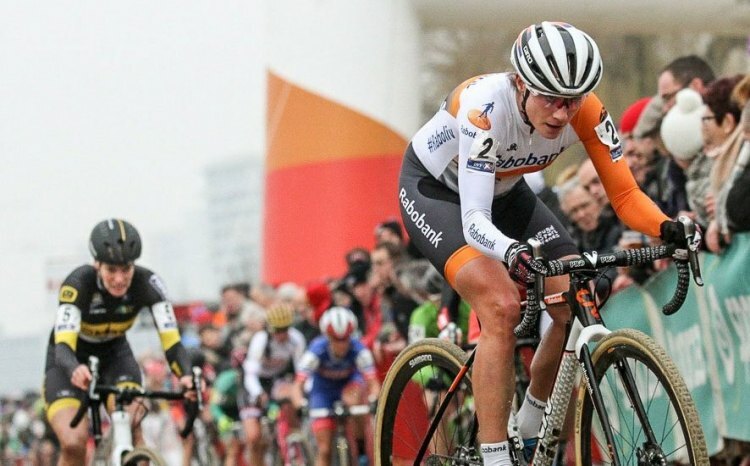 The two remained locked in battle until Vos escaped on the penultimate lap, leaving Van Loy to look behind and see who else might be coming up. Behind, it was a tense, three-way battle for the final podium spot. Cant was starting to struggle, and the chasers, joined by Annemarie Worst (Giant) had her within reach. Cant was caught and passed, but had another surge left in her. 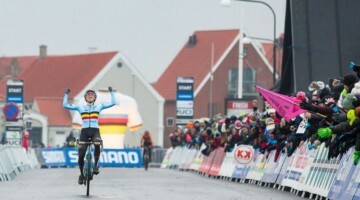 She hit the front again, but there was too much pavement left to hold off De Jong. The World Champ sprinted past Verdonschot and then pipped Cant at the line for third to retain her lead of the IJsboerke Ladies Trophy series. American Elle Anderson rang in the new year with another top ten result, finishing 10th, 2:34 back, in conditions that could prove a good tune-up to a potentially frozen Hartford Nationals course. Stay tuned for video and photos from the 2017 GP Sven Nys.